Ernesto Rodrigues / violin, viola. António Chaparreiro / electric guitar. José Oliveira / percussion, inside piano. These three releases reveal that the language of free improvisation has found a home in Portugal in the hands of string player Ernesto Rodrigues and multi-instrumentalist José Oliveira. Over the course of the three CD’s at hand, the two round out a trio with different partners to explore differing dialects of non-idiomatic, collective playing. 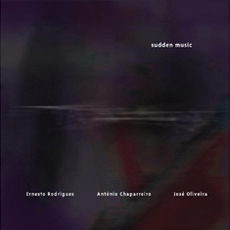 With «Sudden Music», the strategy moves from gathering together accumulated fragments to building improvisations from the foundation of expansive reductivism; gestures distilled down to their barest essences. António Chaparreiro uses his electric guitar as little more than an electronic sound source, squeezing the subtlest hints of scoured and scrubbed strings through muffled distortion. Ernesto Rodrigues starts out with subtle, damped harmonics and stray arco glisses. Oliveira coaxes out pings and dry, rustling percussion scratches, which he augments with hanging shadowy notes drawn from the insides of a piano. In contrast to «Multiples», this trio stretches their improvisations out to the 14? to 20-minute range. Starting from faint, gauzy notes hung in a vast soundscape, the music slowly gathers density and direction. Yet even in a more expansive form, there is still an almost obsessive edge to the playing as the three forage for a collective voice in narrowly prescribed sound spaces. Ernesto Rodrigues’ voice comes through the most effectively in this setting, providing a focal point to the otherwise ethereal collective interactions.